Honor 9N smartphone has been launched as yet another competitor in the burgeoning affordable segment of the Indian smartphone market. The key feature of Honor 9N are the ‘Notch FullView’ display, referring to the display notch, and the bezel-less display design with a 19:9 aspect ratio, a 12-layer premium glass design, and a 16-megapixel selfie camera. 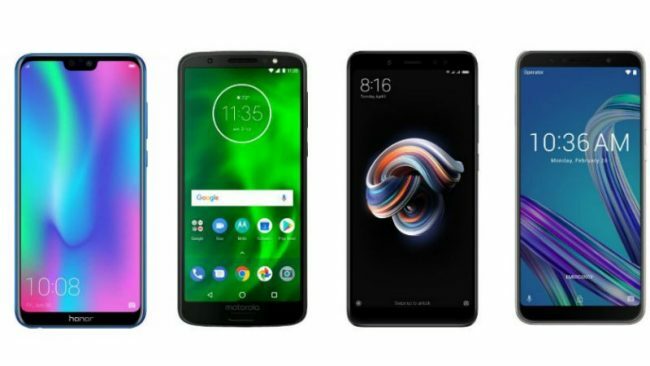 The company at the launch event announced the smartphone will be ‘Made in India’, and we already knew that the smartphone will be sold exclusively on Flipkart. We pit the Honor 9N with its competition, including Xiaomi Redmi Note 5 Pro, Asus ZenFone Max Pro M1, and the Moto G6 to see which one fares better on paper. The Honor 9N (2018) price in India has been set at Rs. 11,999 for the 3GB RAM/ 32GB storage variant, Rs. 13,999 for the 4GB RAM/ 64GB storage variant, and Rs. 17,999 for the 4GB RAM/ 128GB storage variant. The smartphone will go on sale from 12pm IST on July 31 via Flipkart and the HiHonorStore. It will be made available in Lavender Purple, Robin Egg Blue, Midnight Black, and Sapphire Blue. Launch offers include a Reliance Jio cashback offer, with Rs. 2,200 cashback, 100GB additional data, and Rs. 1,200 Myntra voucher. The Xiaomi Redmi Note 5 Pro is priced in India at Rs. 13,999 for the 4GB RAM/ 64GB storage variant as well, and Rs. 16,999 has been set for the 6GB RAM/ 64GB storage model. Available in Black, Gold, Lake Blue, and Rose Gold colour options, the Redmi Note 5 Pro is available via Flipkart, Mi.com, and Mi Home stores. The Asus ZenFone Max Pro M1, on the other hand, is priced in India at Rs. 10,999 for the 3GB RAM/ 32GB storage model and Rs. 12,999 for the model that comes with 4GB RAM and 64GB inbuilt storage. Launched in Midnight Black and Grey colour options, the smartphone is available exclusively via Flipkart. A 6GB RAM/ 64GB storage version was also announced at the India launch event but is yet to make its way to India. The variant is priced at Rs. 14,999. Finally, the Moto G6 price in India is set at Rs. 13,999 for the 3GB RAM/ 32GB onboard storage variant and Rs. 15,999 for the 4GB RAM/ 64GB inbuilt storage model. The smartphone will be available in an Indigo Black colour variant across Moto Hub offline stores, but online exclusively via Amazon India. All the phones support dual-SIM (Nano + Nano) slots, and run different versions of Android. While the Asus ZenFone Max Pro 1 and the Moto G6 sport pure Android Oreo operating system, the Honor 9N has a customised EMUI 8.0 skin on top, and the Redmi Note 5 Pro has a customised MIUI 9 skin on top. The Honor 9N is the lightest of the lot weighing at 157 grams, while the Moto G6 comes in second at 167 grams. Asus and Xiaomi phones weigh almost the same at 180 grams and 181 grams respectively. The Honor 9N is also the thinnest at 7.70mm, while Asus ZenFone Max Pro M1 is the thickest at 8.46mm. Only the Honor 9N sports a display notch, but even then the display size is larger on the Asus and Xiaomi phones at 5.99-inch. The Honor 9N, in comparison, sports a slightly smaller 5.84-inch display, and the Moto G6 sports a 5.7-inch display. Apart from Honor, all the other smartphones go for Qualcomm chipsets, with Asus and Xiaomi sticking to Snapdragon 636 SoC, and Moto G6 sports a Snapdragon 450 SoC. The Honor 9N houses Huawei’s in-house HiSilicon Kirin 659 SoC. While up to 6GB RAM option is offered only by the Redmi Note 5 Pro, the Honor 9N offers up to 128GB inbuilt storage options. All the phones offer microSD card slots for further memory expansion. All the four phones sport a dual camera setup as well. The Honor 9N features a 13-megapixel primary sensor and a 2-megapixel secondary sensor with f/2.2 aperture, alongside an LED flash. The camera also comes with PDAF and supports features such as HDR, time-lapse, and burst mode. On the front, there is a 16-megapixel sensor that works with a beauty mode. The ZenFone Max Pro M1 sports a 13-megapixel primary Omnivision sensor with f/2.2 aperture and a 5-megapixel secondary depth sensing sensor. The front of the smartphone gets an 8-megapixel selfie sensor with f/2.2 aperture and a 5P lens. The Redmi Note 5 Pro, on the other hand, sports a 12-megapixel primary sensor with f/2.2 aperture and a 5-megapixel secondary sensor with f/2.0 aperture, both accompanied by an LED flash. The selfie camera gets a 20-megapixel sensor with an LED selfie light and Beautify 4.0. Lastly, the Moto G6 bears a 12-megapixel primary sensor and a 5-megapixel secondary sensor, combined with f/1.8 aperture. The rear camera comes with features such as a Portrait Mode, Text Scanner mode, and a Spot Color mode. On the front, the smartphone gets a 16-megapixel sensor with beautification capabilities and group selfie mode. Asus ZenFone Max Pro M1 wins in the battery department and it packs a 5,000mAh battery, while the Honor 9N sports the least with a 3,000mAh battery. The Honor 9N has some tough competition in the Indian market, with Xiaomi, Asus, and Moto counterparts fighting well on paper. Huawei’s device falls particularly short in the battery departments however it is the lightest and thinnest of the lot. The Honor 9N is also the only device with a display notch, and if that suits your fancy, then you can give it a thought.